A stand-alone science fiction story set within the universe of the Many Worlds Saga. Approximately 3000 words. Available at Amazon(Kindle), Smashwords, Barnes & Noble, Kobo, the Apple iTunes store, and other ebook retailers. Nancy lives and works on an asteroid called Haven, aka The Rock. The Company which employs and houses her has strict policies regarding who goes and who stays; her co-worker Martin, who wishes to transfer off The Rock, is discovering this fact first-hand. Some of those who've managed to leave in the past are Nancy and Martin's former colleagues turned long-distance circle of friends—now the group gets together in the online virtual reality world of the NEXUS to stay in touch. Real life for Nancy is about to change. Unexpected news is forcing her to confront the Company's policies directly. Policies which have also ensnared the helpless Martin. The best they can hope for may not turn out to be what either of them want. 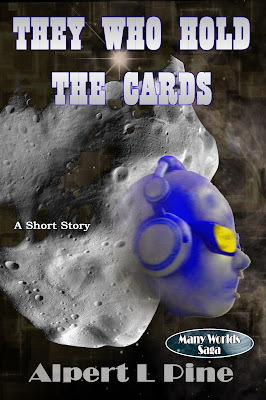 A stand-alone science fiction short story set within the universe of the Many Worlds Saga. Approximately 3000 words. Available from Amazon, Smashwords, Barnes & Noble, Kobo, the Apple iTunes store, and other ebook retailers.